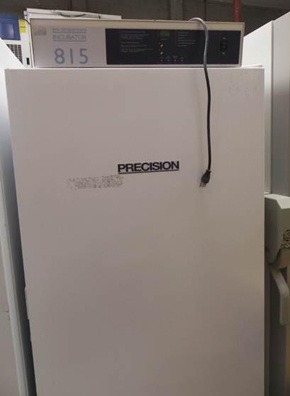 It seems the Precision 815 Low Temperature Incubator ID #: 19074 has been sold and is no longer available. Looking for similar items? Click Here to easily view our available inventory similar to your search. The Precision 815 is a low temperature BOD Incubator. It is microprocessor controlled with high and low temperature protection. The 815 has a capacity of six shelves standard, includes RS-232 and recorder jacks, and dry contacts for alarm hookup. This model is easy-to-clean with corrosion-resistant construction and a gasket door with key lock. This incubator is valuable for a wide range of applications in addition to B.O.D. work. It has 20 cu. ft. storage space, including 2 cu. ft. of space in the door and holds up to 280 B.O.D. bottles, each with a capacity of 300mL. Incubator features push-button temperature set-point selection. Programmable high- and low-temperature deviation alarms with audio and visual indicators help prevent sample freezing or overheating. Control panel is equipped with recorder jacks for temperature documentation. The actual temperature of the chamber is shown on an LED display. Incubator has microprocessor temperature control and uses mechanical convection for optimal uniformity. Standard features include a rear access port which allows the running of sensors and probes to auxiliary equipment within the incubation chamber. UL listed. Thank you for your interest in the Precision 815 Low Temperature Incubator (ID #: 19074). To speak with a representative, please fill out the contact form below or call us directly.